[tps_footer]Aishwarya Rai Bachchan broke off her sabbatical from the silver screen with Sanjay Gupta’s ‘Jazbaa’. The film which saw Aishwarya in an intense avatar of a lawyer impressed the audience. Aishwarya Rai Bachchan is yet again ready to rule the silver screen with her mesmerizing acting skills in the biopic ‘Sarbjit’. The Omung Kumar helmed biopic has been very much in limelight since its inception, but no update on the same has been made since a long time. After a long wait and curiosity, the first look of the biopic ‘Sarbjit’ is out. The first look does not delve into much detail and does not even give a hint about the story line, making it intriguing. The look just depicts the name of the film with the backdrop of a field like landscape and earth and map like background. 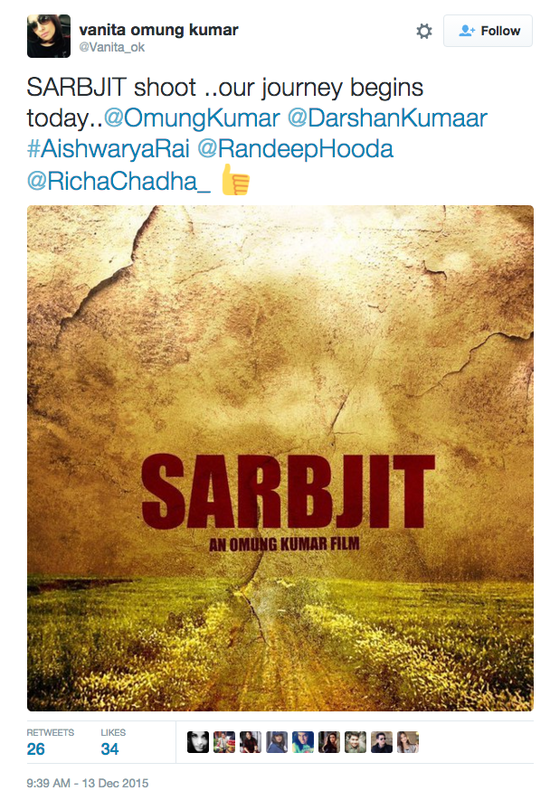 The ‘Sarbjit’ biopic is one of the most sensitive biopics to come up as it will depict the life of Sarabjit Singh who was an Indian farmer and was then convicted of terrorism. Sarabjit spent 22 years behind the bars in Pakistan. He was sentenced to death in 1991 but the sentence got postponed. Sarabjit Singh met with a tragic death when the inmates of the jail attacked him. The highly intense biopic ‘Sarbjit’ is expected to see Randeep Hooda in the character of Sarabjit Singh and Aishwarya Rai Bachchan playing the role of his sister Dalbir Kaur. Actress Richa Chadha might play the role of Sarabjit’s wife. Previous articleBigg Boss 9: Shocking Revelations Made By Kawaljeet Singh After Eviction! Next articleWatch: Katrina Kaif Sets The Glam Quotient High Amidst The Sands!